As the anniversary of the signing of the Korean War Armistice approaches, I would like to take a look back on how the American Red Cross responded to the needs of the soldiers in Korea. 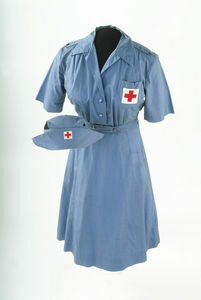 Researching the activities of the American Red Cross during World War II and the Korean War intrigued me. 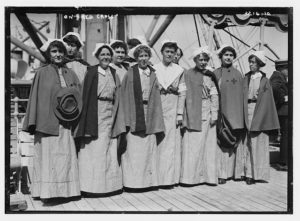 I read many books on the subject, and especially like the novel by Helen Airy, “Doughnut Dollies: American Red Cross Girls During WWII.” Today, the American Red Cross continues to provide comfort stations and first aid to soldiers, sailors, and others caught up in war zones in many lands around the world. As you walk through your day, remember that there are still soldiers and sailors standing guard at the demilitarized zone in Korea, ready to defend freedom. I would like to thank all the women who put their lives at risk to serve in the American Red Cross. I applaud your dedication to duty. Brava, young and old women, you served your country well. You are following in the footsteps of other brave women who sought to serve the American people during wartime. As one example, Red Cross worker Helen Stevenson is swamped by returning First Marine Division men at an airstrip near Pusan, Korea, while passing out coffee and doughnuts from an American Red Cross Clubmobile. Helen is a member of a well-known Red Cross World War II family. At the request of General Douglas MacArthur, the Red Cross expanded its emergency mobile recreation services, enabling the Red Cross to give service not only to American troops, but to all United Nations forces. By November 1950, the Red Cross had opened a center in Pusan and started up subsidiary canteen and clubmobile services for isolated military units, combat returnees, military personnel moving by troop ship, flying personnel, ground crews, and air-evacuated patients. By the spring of 1951, there were 24 Red Cross operational locations servicing Korea, including the stationary centers at Pusan, 5 airfields, and 17 subsidiary installations, including one at the mobile Army surgical hospital (4077th). Also in 1951, President Truman established the federal blood program, designating the Red Cross as the blood collection agency for defense needs. Overall, between 1950 and 1953, the Red Cross collected and procured nearly 5 million pints of blood for the armed forces. 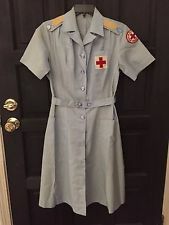 In 1953, the American Red Cross played an active role in Operation Big Switch, which involved the exchange of some 89,000 prisoners of war, nearly 12,000 of them with the United Nations forces that were held in North Korea. 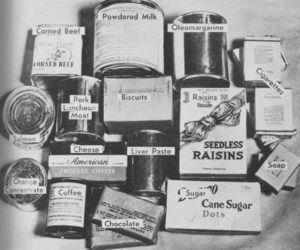 As part of a joint international team, the American Red Cross facilitated POW repatriation and provided badly needed supplies and comfort articles to POWs in North Korea who had been denied them during captivity. Upon their return across the 38th parallel, the American Red Cross provided free telephone calls to their families and other morale and welfare assistance. Each month in 1953, 18,000 Red Cross volunteers, the Gray Ladies, served in military hospitals around the world. Each year of the Korean War, an average of 1,100,000 servicemen received Red Cross assistance at camps and hospitals, at home and abroad. Two Red Cross workers gave their lives in service to the Red Cross during the Korean War. After the signing of the armistice, ending the conflict in Korea in 1953, the American Red Cross maintained a mobile recreation program in Korea to provide recreational activities for members of the U.S. armed forces from 1953 until 1973, at which time the program was discontinued. Approximately 8000 staff served in this program during its existence. Airy, H. (1995). Doughnut Dollies: American Red Cross Girls During WWII. Sunstone Press, Santa Fe, NM.